Ok call me a total geek but I giggled like a mindless supervillian when this dvd came in the mail. Invader Zim has long been one of my favorite and if you ask me one of the most under appreciated kids. Why they ever took it off the air in the first place is beyond me but it's one of those cartoons that adults as well as kids can really enjoy. Actually I was an avid Invader Zim watcher way before I even thought about having kids. Invader Zim's creator Johnen Vasquez is my comic book hero of all time creating the very dark but super funny Johnny the Homicidal Maniac series and Squee both of which will make me squeal for joy and both of which are the two comic books that I read over and over on a fairly regular basis. Invader Zim was most certainly written more for the main stream and lacks most of the dark aspects of the comic book series but it still includes the quirky humor. How can you NOT like Invader Zim... he's a robot banished to Earth and he decides to discuise himself as a human and go to school so he can learn more about the humans. He isn't very popular but maybe that has a little to do with the fact that all he ever thinks about is how he is going to take over the world. My favorite character is by far Gir though.. possibly he is sort of the opposite to Zim like Squee was to Johnny. Melos (my beloved Chihuahua was almost named Gir but I realized he was a little too smart to be Gir early on). Gir is completely mad, totally messed up, robot companion of Zim's and I have to say he's easily if anything a huge factor in why I was totally obessed with this show when it was on the air. They could have made a Gir show all on its own and I would have ended up sitting there hours on end drooling on the screen. He's cute, completely idiotic, and aboslutely hiallrious. Now let me squeal with joy when I tell you that though this is not the complete set of episodes made for Invader Zim, Invader Zim : Operation Doom includes 14 episodes of the series which is close enough to the whole series as if I'm not mistaken there are only 20ish episodes of the show total, which still totally depresses me. And though its not as fancy, nor does it include any extras, as perviously released box sets it will also not set you back $50+ like those would. So if your a Invader Zim fan or if you just want to add a little evil robot takes over the world to your dvd colllection I highly.. HIGHLY.. recommend you buy this dvd. I rarely say this, but if I could recommend any Nickelodean release this year this would hands down be the one I'd buy. 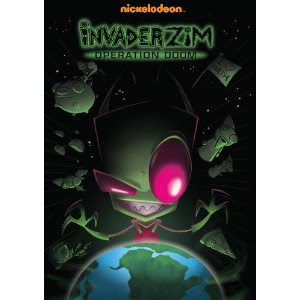 Invader Zim : Operation Doom is gloriously available right now on DVD and you can pick up your copy on Amazon ! Now excuse me while I go do a happy dance.